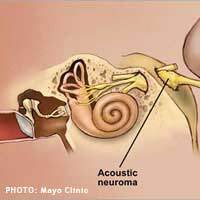 What Is An acoustic Neuroma? An acoustic neuroma is a term given when there is a benign tumour present, which has stemmed from the lining of the auditory nerve of the central nervous system.This nerve, also called the vestibular nerve helps us to achieve a sense of balance and gives us our ability to hear sounds.It is normally a slow growing tumour, but as it can compress the nerve, it normally needs active treatment in order to prevent conditions from worsening. As the tumour grows, it can compromise and compress the nerve, causing hearing impairment and possibly some degree of facial paralysis or tingling of the skin of the face. It is common to experience interferences in balance ability and tinnitus and feelings of pressure in the affected ear may be felt.As the tumour is slow growing, these symptoms may develop very slowly and may even at first, be unnoticeable. Once medial advice has been sought and a thorough history and diagnosis has been undertaken, your GP will normally refer you to a specialist who will order a series of tests to determine the actual diagnosis, size, location and growth rate of the tumour.These tests will normally involve the use of high tech scanning equipment such as an MRI or CT scan, which can take internal images of the affected and surrounding area. At the present time, experts are unsure of a definite cause of this condition and continue to explore and research the topic, hoping to find an early detection system or preventative measure.There is thought to be a link to neurofibromatosis though this has not been definitely clarified. Treatment will depend on the size, location and severity of the symptoms experienced, but will often require a surgical procedure to either partially or totally remove the tumour depending on it’s location and accessibility.Often this is the only treatment needed ands follow-up appointments and tests will assess whether all cells have been excised or if some tumour has been impossible to remove, how fast the remaining cells are growing; this may require more scanning tests.In the event of having a particularly small tumour, no active treatment may be necessary, but normally, in order to warrant seeking medical advice diagnosing the tumour, it is often of quite a large size and in need of an operation. If the nerve has been severely damaged by the pressure of the tumour, hearing aids post-operatively may be needed as full hearing function may not be restorable following surgery. Any numbness or palsy of the face may be treated with physiotherapy and learning a series of approved exercises to try and increase or restore facial muscle tone. If the nerve has been irreparable, some degree of long lasting damage may be continually present.If the tumour infringes on too many nerves, blood vessels or is lying in a particularly awkward position, the doctor may decide to withhold surgery and use radiotherapy instead, with the hope that the radiotherapy will destroy the cells. Acoustic neuroma, although a benign type of tumour can still cause severe problems for the sufferer and treatment will be needed to prevent the symptoms from getting worse.Medical advice should be sought as soon as any of the mentioned symptoms are experienced.